THE NAME OF THE Atlantic Ocean is derived from the Greek god Atlas and means “Sea of Atlas.” Its area is approximately 41 million square mi (106 million square km) including its adjacent seas; volume is approximately 85 million cubic mi (354 million cubic km), including adjacent areas. The average depth of the ocean with adjacent seas is 10,932 ft (3,332 m). The greatest depth is in the North Atlantic at 28,232 ft (8,605 m) in the Milwaukee Deep of the Puerto Rico Trench just north of PUERTO RICO; in the South Atlantic, the greatest depth is 27,651 ft (8,428 m) at the South Sandwich Trench east of the Falkland Islands. The width of the Atlantic varies from 1,769 mi (2,848 km) between Brazil and Liberia to about 3,000 mi (4,830 km) between the United States and northern Africa. The ocean has a coastline of 69,357 mi (111,866 km). Adjacent areas include the CARIBBEAN SEA, Gulf of Mexico, Gulf of St. Lawrence, Hudson Bay, Baffin Bay, MEDITERRANEAN SEA, BLACK SEA, North Sea, Baltic Sea, Barents Sea, Norwegian-Greenland Sea, and Weddell Sea. The Atlantic Ocean is the second-largest of the Earth’s oceans. Covering approximately 20 percent of globe’s surface, the Atlantic is second only to the PACIFIC OCEAN in size. 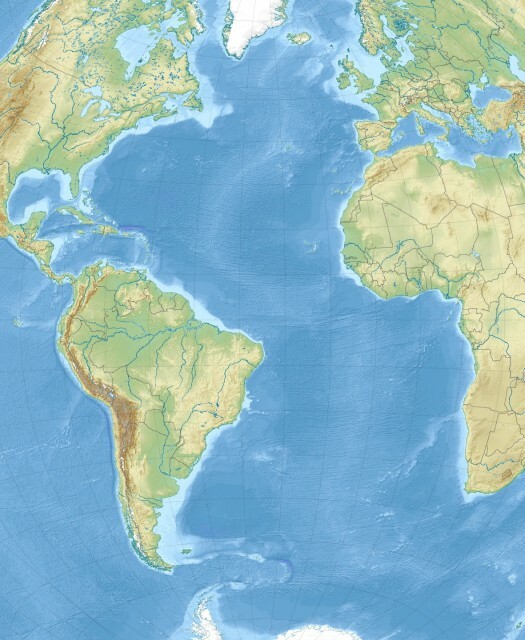 Because the continents bordering its waters in the north are offset to the west of those in the south, the Atlantic appears as an elongated northsouth S-shaped channel. In the north, the Atlantic is bounded by North America on the west and Europe on the east, while in the south it is bounded by South America on the west and Africa on the east. It is also linked to the Pacific Ocean by the ARCTIC OCEAN in the north and by the Drake Passage in the south. The dividing line between the Atlantic and the INDIAN OCEAN to the east has been arbitrarily set at the 20 degrees E meridian, while the dividing line with the Pacific Ocean on the west follows the line of shallowest depth between Cape Horn and the Antarctic Peninsula. In the north, the boundary between the North Atlantic and the Arctic Ocean lies along a system of submarine ridges that extend between Baffin Island, GREENLAND, and Scotland. There is also a boundary between the Atlantic’s northern and southern zones, formed by the equatorial counter currents that circulate just north of the equator (8 degrees north latitude) in an area known as the Intertropical Convergence Zone (ITCZ). The Atlantic Ocean appears to be the youngest of the world’s oceans. It began to form during the Jurassic period, about 150 million years ago, when a rift opened up in the supercontinent of Gondwanaland, resulting in the separation of South America and Africa. The separation continues today at the rate of several centimeters a year along the Mid-Atlantic Ridge, a great submarine mountain range that extends from ICELAND in the north to approximately 60 degrees south latitude, dividing the Atlantic into a series of somewhat equal basins (also known as ABYSSAL PLAINS). Roughly 930 mi (1500 km) wide, the ridge has a more rugged topography than any mountain range on land and ranges from about 0.6 to 2 mi (about 1 to 3 km) above the ocean bottom. The ridge is a continuous feature of the Atlantic floor with one exception, the Romanche Furrow near the equator where the crest of the ridge drops significantly (15,000 ft or 4,573m) below the surface, allowing deep waters to flow freely between the Atlantic’s eastern and western basins. Other transverse ridges running between the continents and the Mid-Atlantic Ridge divide the ocean floor into numerous other sub-basins including the Guiana, North American, Cape Verde, and Canaries basins in the North Atlantic and the Angola, Cape, Argentina, and Brazil basins in the South Atlantic. The large Atlantic- Antarctic Basin lies between the southernmost extension of the Mid-Atlantic Ridge and the Antarctic continent. Although all of its abyssal basins are deeper than 16,400 ft (5,000 m), with many beyond 19,680 ft (6,000 m), the average depth of the Atlantic Ocean is 2 mi (3,300 m), less than the mean depths of both the Pacific and Indian oceans. Unlike the other oceans, the Atlantic has a high percentage (13 percent) of shelf seas (areas where continental crust is covered by water), which is two to three times the percentage found in the other oceans. The Atlantic has a relatively small number of islands in comparison to the Pacific, with the greatest concentration found in the Caribbean region. Most of the islands are structurally part of the continents. The major islands of the Atlantic include Svalbard, Greenland, Iceland, Great Britain, IRELAND, Fernando de Noronha, the AZORES, the Madeira Islands, the CANARY ISLANDS, the CAPE VERDE Islands, BERMUDA, the West Indies, ASCENSION, ST. HELENA, Tristan da Cunha, the FALKLAND ISLANDS, and the SOUTH GEORGIA Islands. NEWFOUNDLAND is the principal island on the North American shelf, the British Isles the major island group of the Eurafrican shelf, the Falkland Islands the only major group on the South American shelf, and the South Sandwich Islands on the Antarctic shelf. The islands of Puerto Rico, Hispaniola, JAMAICA, and CUBA (the Antilles) are part of an oceanic arc, while the Madeiras, Canaries, Cape Verde, and the Sao Tome and Principe group are the peaks of submarine ridges. The Azores, Saint Paul’s Rocks, Ascension, and the Tristan da Cunha group are peaks of the Mid-Atlantic Ridge system, while the large island of Iceland is a volcanic hotspot at the northern end of the Mid-Atlantic Ridge. Bermuda rises from the floor of the North American Basin, and St. Helena from the Angola Basin. The Atlantic consists of four major water masses. The North and South Atlantic central waters constitute the surface waters. Sub-Antarctic intermediate waters extend to depths of 3,300 ft (1,000 m), while the North Atlantic deep waters reach depths of as much as 13,200 ft (4,000 m). The Antarctic bottom waters are found at depths greater than 13,200 ft (4,000 m). Waters in the North Atlantic have a clockwise circulation (due to the Coriolis force), while those in the South Atlantic circulate counterclockwise. In addition, the land area that drains into the Atlantic is four times that of either the Pacific or Indian oceans. The major river drainage basins affecting the Atlantic include waters from many of the principal rivers of the world, among them the ST. LAWRENCE, MISSISSIPPI, Orinoco, AMAZON, Paraná, CONGO, NIGER, and LOIRE, and the rivers emptying into the North, Baltic, and MEDITERRANEAN seas. The circulatory system of the Atlantic’s surface waters consists of two large gyres (or circular current systems), with one in the North Atlantic and the other in the South Atlantic. These gyres or current systems tend to be wind driven but are also influenced by the rotation of the Earth. The currents of the North Atlantic (the North Equatorial Current, the Canaries Current, and the GULF STREAM) flow in a clockwise direction from the equator to about 45 degrees north latitude, while those in the South Atlantic (the Brazil, Benguela, and South Equatorial currents) flow counterclockwise from near the equator to about 45 degrees south latitude. As you approach the polar zones, the currents are less completely defined, with one rotating counterclockwise in the Arctic regions of the North Atlantic and another in the South Atlantic rotating clockwise near Antarctica. Surface salinity values are influenced by evaporation, precipitation, river inflow, and melting of sea ice. The salinity of the surface waters in the open Atlantic range from 33 to 37 parts per thousand, depending on latitude and season. Minimum salinity values are usually found at high latitudes and along coasts of continents where large river flows affect concentration. Given the volume of water discharged by the Amazon River in northeastern South America, minimum salinity values for the Atlantic are found just north of the equator. The area with the highest salinity values occurs in a part of the Atlantic referred to as the SARGASSO SEA. The Sargasso is somewhat of an ocean desert, with very little rainfall. Given the regions latitude, rates of evapotranspiration (evaporation exceeding rainfall) are quite high leading to the high salinity values in the surface waters. Surface water temperatures, which are influenced by latitude, current systems, and season, range from 28 degrees F to 84 degrees F (-2 degrees C to 29 degrees C). The most active circulation is found in the uppermost layer of warm water. Below this, circulation becomes increasingly sluggish as the temperature decreases. Surface temperatures range from 32 degrees F (0 degrees C) at the Arctic and Antarctic margins, to 81 degrees F (27 degrees C) at the equator. At depths below about 6,600 ft (2,000 m), temperatures of 36 degrees F (2 degrees C) are prevalent; and in bottom waters, those below 13,200 ft (4,000 m), temperatures of 30 degrees F (-1degrees C) are common. The ocean has also contributed significantly to the development and economy of the countries around it. Besides its major transatlantic transportation and communication routes, the Atlantic contains some of the world’s most productive fisheries. The most productive of these include the Grand Banks off Newfoundland, the shelf area off Nova Scotia, Georges Bank off Cape Cod, the Bahama Banks, the waters around Iceland, the Irish Sea, the Dogger Bank near the North Sea, and the Falkland Banks. The major species of fish caught in these areas are cod, haddock, hake, herring, and mackerel. There are also abundant petroleum deposits in the sedimentary rocks of the continental shelves. Large amounts of petroleum are currently being extracted in the North Sea and in the Caribbean Sea and Gulf of Mexico region, with lesser amounts coming from the Gulf of Guinea near the African coast. Actively mined mineral resources include titanium, zircon, and monazite (phosphates of the cerium metals), off the eastern coast of Florida, and tin and iron ore, off the equatorial coast of Africa. The Atlantic is currently served by a large number of ports and harbors, including major ports or harbors in Alexandria (EGYPT), Algiers (ALGERIA), Antwerp (BELGIUM), Barcelona (SPAIN), Buenos Aires (ARGENTINA), Casablanca (MOROCCO), Colon (PANAMA), Copenhagen (DENMARK), Cork (Ireland), Dakar (SENEGAL), Gdansk (POLAND), Hamburg (GERMANY), Halifax, Nova Scotia (CANADA), Helsinki (FINLAND), Las Palmas (Canary Islands, Spain), Le Havre (FRANCE), Lisbon (PORTUGAL), Liverpool (UNITED KINGDOM [UK]), London (UK), Marseille (France), Montevideo (URUGUAY), Montreal (Canada), Naples (ITALY), New Orleans (UNITED STATES), New York (United States), Newport News (United States) Oran (Algeria), Oslo (NORWAY), Peiraeus (GREECE), Rio de Janeiro (BRAZIL), Rotterdam (NETHERLANDS), Saint Petersburg (RUSSIA), Southampton (UK), and Stockholm (SWEDEN). While these ports play active roles in the economies of the countries bordering the Atlantic, the PANAMA and Suez canals (as links to the Pacific and Indian oceans) greatly enhanced that value by shortening the distance to markets on the Pacific Rim or within the Indian Ocean. The Atlantic is currently faced with a number of important environmental issues, including endangered marine species (manatees, seals, sea lions, turtles, and whales); drift net fishing; municipal sludge pollution from the eastern United States, southern Brazil, and eastern Argentina; oil pollution in the Caribbean Sea, Gulf of Mexico, Lake Maracaibo, Mediterranean Sea, and North Sea; and industrial waste and municipal sewage pollution in the Baltic Sea, North Sea, and Mediterranean Sea. Natural hazards include icebergs, which are common in the Davis Strait, Denmark Strait, and the northwestern Atlantic Ocean, particularly between February and August. Occasionally, they have been spotted as far south as Bermuda and the Madeira Islands. Ships traveling in the extreme northern Atlantic from October to May are subject to heavy icing on their superstructure, and persistent fog can be a major hazard anytime between May and September. Hurricanes also pose a significant threat to the land areas along the Atlantic coast and tend to be most common between May and December.